As a writer, I do a lot of research for my stories. And sometimes, that research requires a map. As I was playing around with the sequel to Unperfected, I used Columbus, OH as a location. It was one of those moments where I was in a writing zone and the characters were basically writing themselves. I needed a city in Ohio that wasn't Cincinnati and was still a decent size, so boom--Columbus popped into my head. Only, I realized as I continued writing that I had absolutely no idea what Columbus looked like. But luckily, Google Maps exists! For the longest time, I struggled with figuring what the heck my story world looked like. Was the city big or small? Were there a lot of alleys? Dead ends? Was one part of the city more crowded than the other? What did the main road look like? I quickly discovered that Google Maps was the perfect tool for this issue. Just search for a few cities you've heard of, or maybe just zoom in somewhere random and find someplace new. Then, just switch your map to the earth view, and voila. Endless aerial inspiration for you to study, describe, and re-imagine. On Google Maps, you can find directions from one place to another and (usually) choose from a variety of routes to take. This is extremely helpful in writing, especially thanks to the fact that you can pick which method of transportation you want to use. You could map how far your characters live from each other and get an estimate on how long it would take them to walk to each other's houses. You could see how many hours it takes to get from one rebel camp to the other by plane. You could see how long it takes to get from Japan to LA by regular plane and use that timing as a starting point for figuring how long it would take your super fast futuristic plane to do the job. The possibilities are endless! And while the exact distance may not be necessary in the story itself, it can be great information for you as the author to just have and know. I. Love. Street View. Going back to what I said before, I had no idea what Columbus looked like. So I searched the city on Google Maps, dragged the little orange Street View guy where I wanted, and virtually walked the same path I make my characters take in the book. I looked at the landmarks and buildings around me and used them appropriately, as well as street names. Street view is incredibly helpful when you're writing about places you've never been before--and it's pretty fun to use, too! 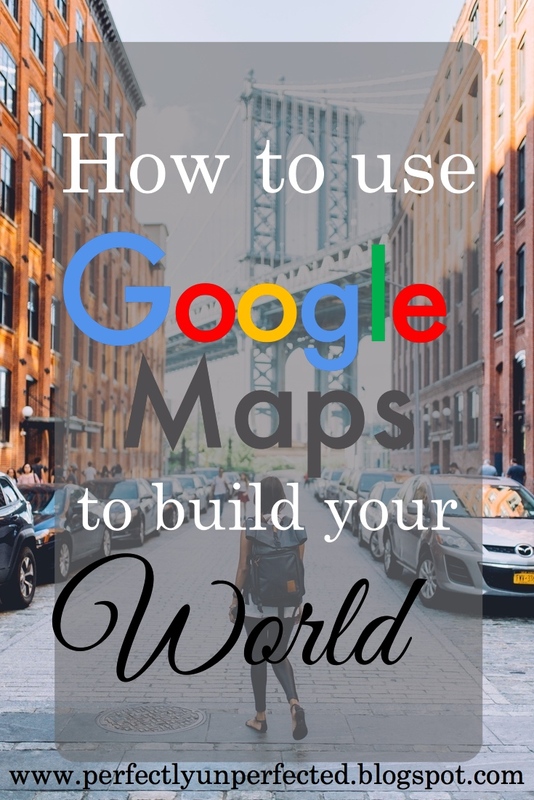 Did you know that you can create a custom map on Google Maps? I didn't, until a few months ago. I used the feature to create a map for my trip to D.C. I took in June, and now I can't wait to use this feature for future writing purposes--especially if I ever write some sort of road trip story. With a custom map, you can label and tag multiple places on your map for easy finding. For example, in my D.C. map I labeled all the sites we wanted to see and used different symbols based on what those sites were. You could use this feature for lots of different things. Just have fun with it! This feature is definitely helpful if you're stuck in a scene and don't know what to have your character do next. When I was writing my characters in the middle of Columbus, I got stuck in the scene. So, I used Google Maps to see what sorts of buildings and attractions were nearby. Just search the location you're using in your story and then click "search nearby" just below the search panel. You can search restaurants, stores, parks, and more! I ended up finding a library near where my characters were, and it inspired me to write a scene there. And there you have it. 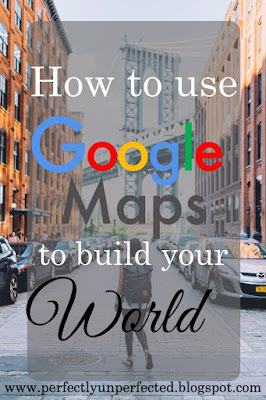 With an hour or two of time and some exploring around the site, Google Maps can prove to be a super helpful tool for the writing world.